Two of our best smartwatches are getting sequels as Chinese company Mobvoi has announced the TicWatch S2 and TicWatch E2 at CES 2019. The new devices aren't dissimilar to the original TicWatch E and TicWatch S variants, but there are a few improvements here, including waterproofing that means you can take either device into the pool for a swim. Both the TicWatch E2 and TicWatch S2 are waterproof up to 50 meters, so this should be able to monitor your lengths up and down your local pool – but it isn't designed for diving. There's a swim-monitoring mode on each watch too to give you an idea of how you're improving in the water. Both watches sport similar specifications, and the main differences lie in the designs that you can see below. The E in the E2 name stands for "express" while the TicWatch S2 is the "sport" variant. 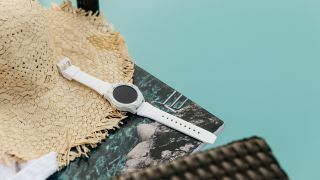 The watch casing is made of polycarbonate and both are available in black, with a white version of the TicWatch S2 set to launch later in 2019. Each uses 22mm silicone straps, and you should be able to use your own straps with them too. These are each powered by Wear OS software and feature the Qualcomm Snapdragon Wear 2100 chipset. That's not the latest and greatest, which we've seen running in devices like the Fossil Sport and Montblanc Summit 2, but it should still run well on these watches. Mobvoi also claims the battery life has been improved on each watch by 30%, so you should be able to get somewhere between a day or two from a single charge. We found both the original watches lasted for a single day, so we're hoping it's more toward the two-day mark for the next generation. Each has a 1.39-inch AMOLED display with a resolution of 400 x 400, plus there's a heart rate sensor on the rear of each watch and GPS to track your runs too. We don't currently have an exact release date for the TicWatch E2 or the S2, and we don't know pricing information yet either in most markets. The original TicWatch E launched for at $159.99 (around £120) and the TicWatch S was $199.99 (around £150) so we'd expect similar pricing to that for the next-gen devices. Down Under, however, both new smartwatches will be available to buy exclusively from Amazon Australia soon after CES winds up, with the TicWatch E2 retailing for AU$238.99 and the TicWatch S2 priced at AU$282.99.